The illustration below identifies the main elements on the Contribution List page. Place your mouse pointer over a hyperlink (without clicking) to view a general description of the element. Click the link to jump to the section on this page that provides more detailed information. Click in the Start Date range field to set a start date, and then click in the End Date field to set an end date. Click to display contribution records within the specified date range. The ParishSOFT Giving Only checkbox is visible only if the organization administrator enables the ParishSOFT Giving option (on the Module Settings page in the Administration module). For information on enabling this option, see online Help in the Administration module. The ParishSOFT Giving Only checkbox enables you to filter the Contribution List grid to show only those electronic contributions that came into the Offering module from ParishSOFT Giving. By default, the checkbox is deselected so that all contributions are visible. To view electronic gifts only, select the checkbox. 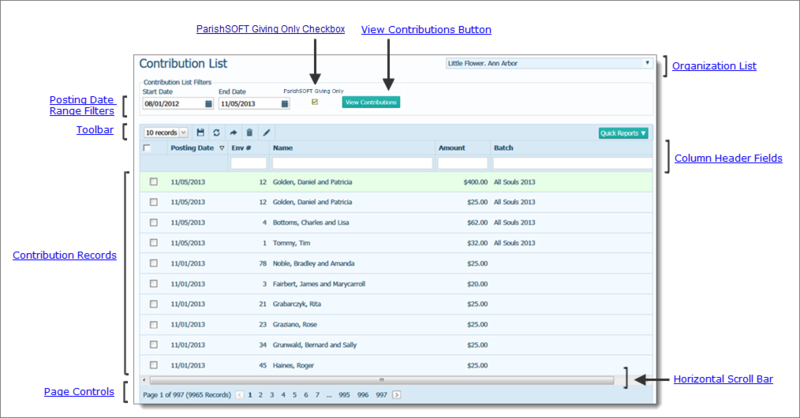 Click to display contribution records matching filter selections. By default, the quick reports use the Posting Date column (Descending) for the primary sort and the Name column (Ascending) for the secondary sort. To change the default for the primary sort, simply select a different column in the grid and specify the desired sort order. The system selects the secondary sort criteria based on your primary sort selection. For descriptions of the sort criteria used in the quick reports, go to Sort Criteria Used in the Contribution List Quick Reports. ● Click once to select all records listed on the page you are viewing. A checkmark appears next to each entry after you check the box to indicate that the record is selected. You may need to use this global checkbox when you have a lot of contributions to select or when most of the contributions should be selected. You can then individually deselect (uncheck) those contributions you do not want to work with. ● Click again to deselect all previously selected records in the list. The checkmark next to each entry is removed after you check the box again.